Concerned citizens packed Bellevue Council chambers for the Energize Eastside Public Hearing. Details on our Hearing page. Energize Eastside is NOT a done deal! The Public Hearing on the south segment began March 28th and was extended for another 3 days due to the large public turnout. The final day of the hearings will be Monday April 8th, but no public comment will be taken. For details of the hearing, see our Hearing Info Page. Newcastle recently retained Synapse, an industry consultant, to perform an independent evaluation of the need for Energize Eastside. The consultant will also study the safety risks of installing large poles very close to 50-year-old petroleum pipelines located near downtown Newcastle and several residential neighborhoods. The results of the study were expected in March 2019 so they should be released soon. A recommendation by the city and a public hearing will follow. PSE’s application to build Energize Eastside in Renton is on hold while a consultant evaluates the consistency of PSE’s permit application with the Environmental Impact Statement. A final report is expected in April. A recommendation by Renton and a public hearing will occur later. In 3 minutes, you will get a quick overview of CENSE, Energize Eastside and CENSE’s vision of better ways to provide the Eastside with reliable electricity. Help us spread the word. Please share with your friends and post on your social media. and we’ll keep you up to date on Energize Eastside and our efforts to promote better solutions. Spread the word! 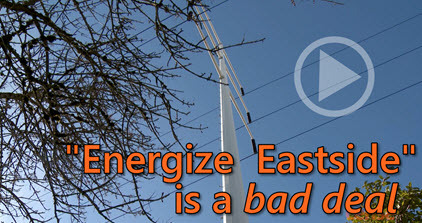 Tell your neighbors about CENSE and Energize Eastside. Donate to CENSE so we can represent you in the legal battle against Energize Eastside! Your donation helps us to represent you in our promotion of smart energy choices for the Eastside.